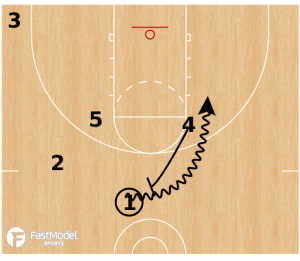 This man to man play initiating with an Iverson cut was contributed by Coach Zach Weir to the FastModel Sports Basketball Plays and Drills Library. Zach is the assistant boys coach at South Grand Prairie High School in Texas. 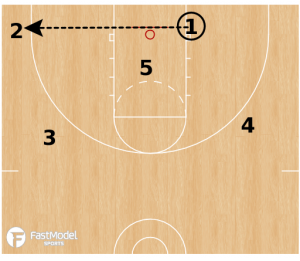 ATO Hammer set designed to get your best shooter a corner three. 3 will space to the corner. 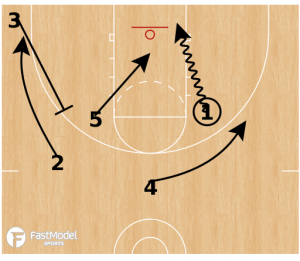 5 will step out and set a ball screen for 2. 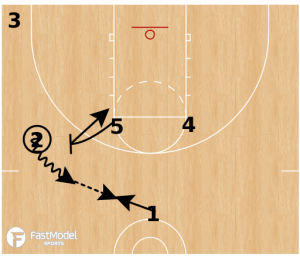 1 will move to the midline to setup a ball screen by 4. 2 will pass back to 1. 4 sets a step up screen for 1. 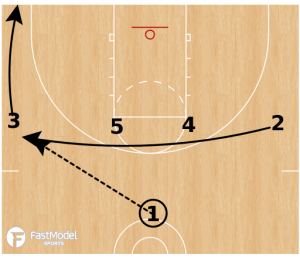 3 sets a hammer screen for 2. 5 runs to the rim.